This recipe was created at a time when there were no modern sunscreens, and people then were also exposed to the sun. 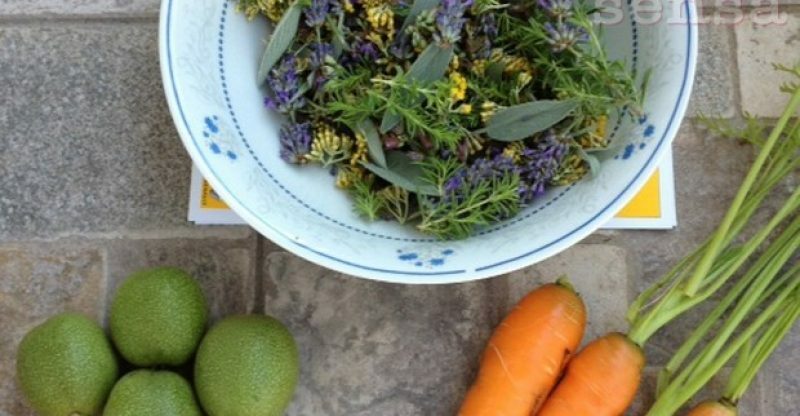 In a glass bottle with a wide aperture or slightly larger jar put a few carrots, a few chopped green walnuts, very few lavender flowers, and also can be added a few flowers of sage. 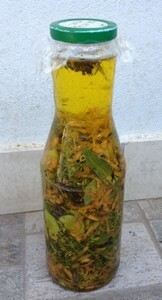 The bottle has to be filled with approximately 60-70 percent of these contents, then put the extra-virgin olive oil to its top. Left the mixture in the sun light for 20 to 25 days, shake it a little each day and eventually fine-strained through several layers of gauze. Olive oil has a natural protective factor of 2, which is negligible protection for today’s radiation, but with carrot and walnut it has naturally bigger factor, so they significantly raises the safety factor of our oil, and also nourishes the skin. Carrots are rich with beta-carotene and vitamin A, and are also used in modern sunscreens because it rejuvenates the skin and slows down its aging, prevents photo-sensitivity and accelerates tanning. Lavender and sage are great for skin care, have anti-inflammatory effect on acne, burns, wounds and the sage, salvia officinalis, also reduces cellulite. In addition, these ingredients give a wonderful aroma oil.